Background: Translation is the process where amino acid residues are assembled into polypeptides on ribosomes. This process is generally divided into three stages: initiation, elongation and termination. During elongation, mRNA and tRNA pair at the two active sites (A and P sites) on the ribosome. A number of eukaryotic elongation factors (eEFs) are involved in this process in mammalian cells (1). eEF1A, also called elongation factor Tu (EF-Tu), binds GTP and interacts with amino acyl-tRNAs to promote recruitment of amino acyl-tRNAs to the A-site of the ribosome (1). 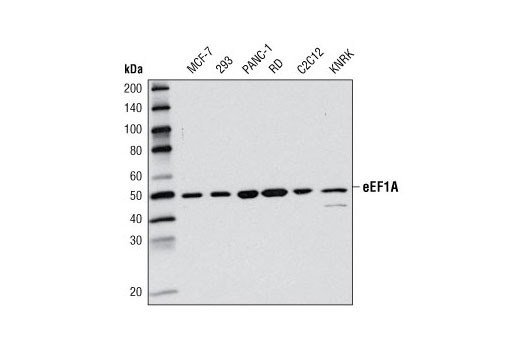 After GTP hydrolysis, GDP-eEF1A leaves the ribosome and is later converted back to the GTP-eEF1A by eEF1B (1). 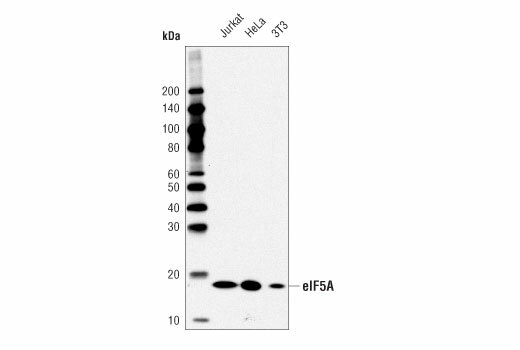 Studies have shown that eEF1A is phosphorylated under certain conditions, indicating that its activity is regulated at the post-translational level (2,3). Background: Eukaryotic initiation factor 5A (eIF5A) is an mRNA-binding protein that is involved in translation elongation and plays an important role in promoting translation of polyproline motifs (1-4). The eIF5A (eIF5A1) and eIF5A2 genes encode the two vertebrate eIF5A isoforms. While eIF5A1 is expressed constitutively in all tissues, eIF5A2 is mainly expressed in gonads. eIF5A and eIF5A2 are the only identified proteins that contain the distinctive amino acid hypusine, which is generated posttranslationally from lysine through a highly conserved polyamine metabolism pathway. eIF5A function and hypusine modification are both essential for cell proliferation, as knock down of eIF5A expression or blocking eIF5A hypusine modification suppresses cancer cell proliferation (5-7). Interestingly, eIF5A is an identified component of a tumor suppressor network of the polyamine-hypusine axis. Co-suppression of both eIF5A and adenosylmethionine decarboxylase 1 (AMD1) promotes lymphomagenesis in mice, while heterozygous deletions of the corresponding AMD1 and eIF5A genes often occur together in human lymphomas (8).